Global Gasoline Gensets Market size was valued over USD 3 billion in 2018 with annual shipments set to exceed 8 million units by 2025. Growing intensity and severity of weather-related blackouts along with escalating reliance on backup power solutions to sustain daily-life operations will stimulate the global market size. Inadequate power supply, chronic outages, shifting consumer preferences in addition to ongoing infrastructural expansion will further impart an impetus to the industry growth. The prominence of these gensets can be significantly attributed to their lower price index and multi-use capacity which is suitable for varying end-user requirements. Growing demand for consistent power supply in response to the inadequate grid infrastructure will boost the market growth. For instance, the sub-Saharan economies, where power outages span for the majority of hours will continue to involve a robust deployment of these gensets. In some cases, it may be cheaper to generate electricity through generators when compared with electricity drawn from the grid. The 3.5-5 kVA gasoline gensets market size is anticipated to grow over 5% by 2025. The ability of these units to adequately cater to consumer power requirements, predominantly across residential establishments will favor their penetration in the industry. 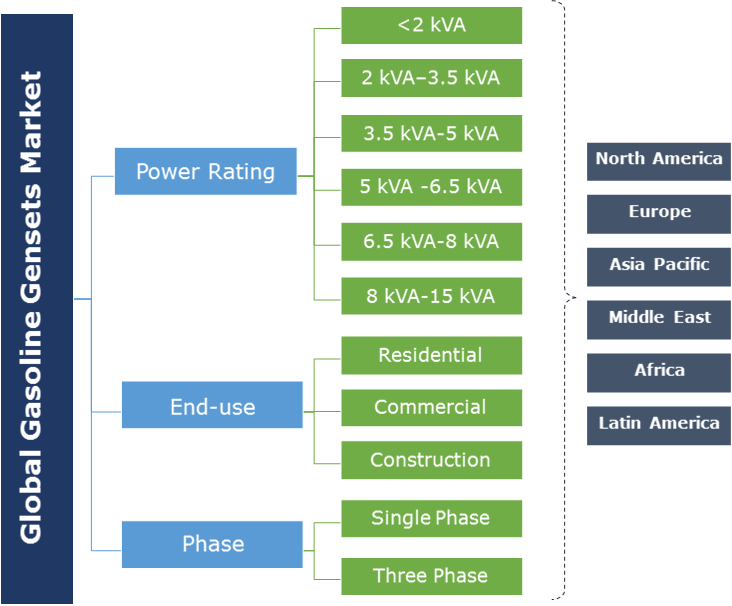 Moreover, the ongoing consumer shift toward lesser powerful units for residential operations, is further attributed to their economic viability and operational suitability. Residential applications, in 2018 accounted for over 50% of the global market share. Growing significance of backup power & emergency preparedness measures in response to frequent and intensifying electrical outages will boost the adoption of residential gasoline gensets. These units are gaining momentum on account of increasing power failures, intensifying natural disasters and deteriorating grid resilience. Growing deployment of backup power solutions for outdoor recreational activities will stimulate the commercial gasoline gensets market growth. These gensets are majorly deployed for tailgating, camping trips, sudden blackouts, Recreational Vehicle (RV) power, and other outdoors activities. Progressing consumer inclination toward adventure travel, and other leisure activities will boost the demand for RVs, thereby creating cyclical demand for these gensets. Construction gasoline gensets market is predicted to expand over 5% by 2025. These portable units allow contractors to sustain their job without disruption by providing a quick and steady power supply. The burgeoning industry expansion is significantly attributed to growing reliance on electricity & technology advancements along with surging demand from infrastructural expansion, real estate development, and rapid industrialization. 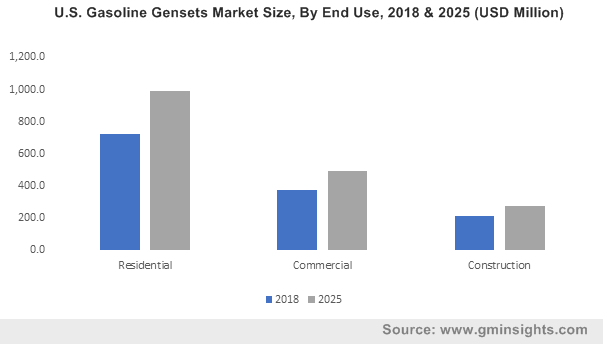 Three phase gasoline gensets market is predicted to grow over 5% by 2025. These units are the most commonly deployed gensets and will continue to dominate the industry in the following years. These gensets illustrate a simpler machinery and operation with minimal external circuitry requirements. The ongoing product penetration can be widely linked to the strengthening construction activities. Increasing customer awareness coupled with unreliable grid infrastructure will continue to sustain the expansion of the single-phase gasoline gensets market. The application of these gensets is predominantly suited for residential installations on account of their operational suitability for smaller power ranges and relatively low maintenance requirements. The U.S. market will witness robust growth on account of prolonged power outages, increased consumer awareness, fragile power grid systems accompanied by elevating power demand in the country. The consumer demand for these gensets varies on annual basis corresponding to electrical outages, majorly triggered by hurricanes along the Gulf and Atlantic coasts. Europe market is anticipated to expand over 4% by 2025. Positive outlook toward the construction sector, low oil prices, and rising infrastructure investments will entail the deployment of these gensets. Moreover, growing consumer interest toward outdoor recreational activities across the region will further contribute to the industry growth. Asia Pacific market will witness an appreciable momentum on account of the ongoing proliferation of commercial, industrial, and residential establishments. The region, led by China, is evolving as the key market for the deployment of generator sets across a broad array of applications. In addition, several Southeast Asian countries including Indonesia are witnessing robust construction spending, thereby further imparting an impetus to the burgeoning industry expansion across the region. Notable industry players operating across the global gasoline gensets market include Generac, Briggs & Stratton, Cummins, Kirloskar, Kohler, Caterpillar, Yamaha Motor, Honda, Atlas Copco, Wacker Neuson, John Deere, Firman Power Equipment amongst others. Emissions compliances, technological innovations, extended service & distribution network cost competitiveness, and product differentiation are the vital strategic assets for an industry participant to attain a competitive position. A gasoline genset maybe defined as an electrical generator set fueled by gasoline. It essentially serves the purpose of a portable genset which is commonly deployed for emergency backup power solution in households or as a source of power in construction sites and outdoor recreational activities (camping and tailgating). Gasoline gensets are often referred to portable gensets on account of their ability to be mobilized.